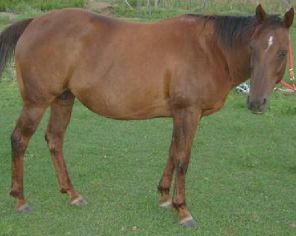 PJ is a well-broke mare, has team penned in her past, has incredible ground manners, and can be ridden by anyone. We give lessons on her, but she is handy enough for experienced riders, too. She has been a great mom, good milker and is attentive but not clingy to her babies. PJ has the stocky foundation look, a beautiful head and neck, and some get up and go when she needs it. 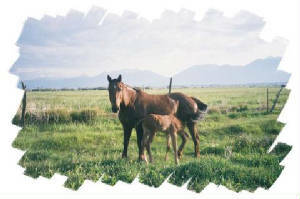 We've seen this mare make her way around the pasture, 10 months pregnant, and wished we had a stopwatch to time her! 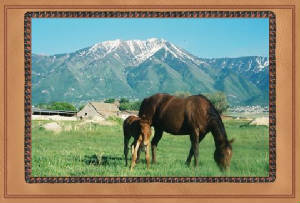 PJ gives her foals healthy athleticism and quiet minds, and the cross between PJ and Hank seems to be a magical one. Nita is our best foal this season, with her huge rump and beautiful color. Click on this link for a more complete pedigree from allbreedpedigrees.com. Type in Peppys Little Jetta.